This article is about the memorial day to honour the war dead following the Armistice at the end of World War I. For memorials on 11 November after World War II, associated traditions in Commonwealth countries and more details of related memorials in other countries, see Remembrance Day. Armistice Day is commemorated every year on 11 November to mark the armistice signed between the Allies of World War I and Germany at Compiègne, France at 5:45 am, for the cessation of hostilities on the Western Front of World War I, which took effect at eleven o'clock in the morning—the "eleventh hour of the eleventh day of the eleventh month" of 1918. But, according to Thomas R. Gowenlock, an intelligence officer with the US First Division, shelling from both sides continued for the rest of the day, only ending at nightfall. 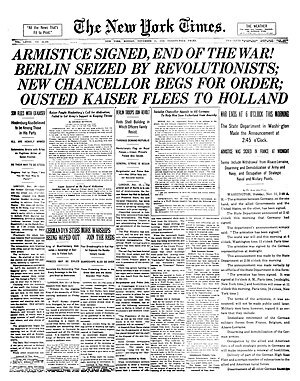 The armistice initially expired after a period of 36 days and had to be extended several times. A formal peace agreement was only reached when the Treaty of Versailles was signed the following year. The date is a national holiday in France, and was declared a national holiday in many Allied nations. During World War II, many countries changed the name of the holiday. Member states of the Commonwealth of Nations adopted Remembrance Day, while the US chose Veterans Day. In some countries Armistice Day coincides with other public holidays. On 11 November 2018, the centenary of the World War One Armistice, commemorations were held globally. In France, more than 60 heads of government and heads of state gathered at the Arc de Triomphe in Paris. The first Armistice Day was held at Buckingham Palace, commencing with King George V, hosting a "Banquet in Honour of the President of the French Republic" during the evening hours of 10 November 1919. The first official Armistice Day events were subsequently held in the grounds of Buckingham Palace on the morning of 11 November 1919, which included a two-minute silence as a mark of respect for those who died in the war and those left behind. This would set the trend for a day of remembrance for decades to come. In Britain, beginning in 1939, the two-minute silence was moved to the Sunday nearest to 11 November in order not to interfere with wartime production should 11 November fall on a weekday. This became Remembrance Sunday. After the end of World War II, most member states of the Commonwealth of Nations, like the United Kingdom and (as Canada had in 1931), adopted the name Remembrance Day. Other countries also changed the name of the holiday just prior to or after World War II, to honor veterans of that and subsequent conflicts. The United States chose All Veterans Day, later shortened to 'Veterans Day', to explicitly honor military veterans, including those participating in other conflicts. In the United Kingdom and Commonwealth countries, both Remembrance Day and Remembrance Sunday are commemorated formally, but are not public holidays. The National Service of Remembrance is held in London on Remembrance Sunday. In the United States, Veterans Day honours American veterans, both living and dead. The official national remembrance of those killed in action is Memorial Day, which predates World War I. Some, including American novelist Kurt Vonnegut and American Veteran For Peace Rory Fanning, have urged Americans to resume observation of 11 November as Armistice Day, a day to reflect on how we can achieve peace as it was originally observed. In Poland, National Independence Day is a public holiday, celebrated on 11 November to commemorate the anniversary of the restoration of Poland's sovereignty as the Second Polish Republic in 1918, after 123 years of partition by the Russian Empire, the Kingdom of Prussia and the Habsburg Empire. "Armistice Day" remains the name of the holiday in France ("Armistice de la Première Guerre mondiale") and Belgium. It has been a statutory holiday in Serbia since 2012. Serbia is an Allied force that suffered the biggest casualty rate in World War I. To commemorate their victims, people in Serbia wear Natalie's ramonda as a symbol of remembrance. Ceremonies are held in Kenya over the weekend two weeks after Armistice Day. This is because of the armistice only reached African forces, the King's African Rifles, still fighting with great success in today's Zambia about a fortnight later, where the German and British commanders then had to agree on the protocols for their own armistice ceremony. ^ Some sources report (all in identical words) that the South Australian State Branch of the Returned Sailors & Soldiers' Imperial League of Australia developed a simple ceremony of silence for departed comrades at 9 p.m., but there is no reliable source confirming that this happened on Armistice Day. The Club Palm Beach (formerly Palm Beach RSL) reports that a silence was observed in Adelaide in 1916 to mark the landing at Gallipoli. ^ ""How World War I Soldiers Celebrated the Armistice". ^ Gowenlock, Thomas (1937). "Soldiers of Darkness. Doubleday, Doran & Co. OCLC 1827765. ^ Shushkewich, Val (12 September 2005). The real Winnie : a one-of-a-kind bear. Natural Heritage Books. p. 42. ISBN 9781554883509. ^ Osborne, Samuel (11 November 2015). "Armistice Day, Remembrance Day and Veterans Day - what's the difference?". The Independent. Archived from the original on 18 November 2018. Retrieved 18 November 2018. ^ Addley, Esther (12 November 2018). "People gather around world to mark armistice centenary". Retrieved 18 November 2018. ^ "Banquet in honour of The President of the French Republic, Monday 10 November 1919". Royal Collection Trust. Inventory no. 1000799. ^ Osborne, Samuel (11 November 2015). "Armistice Day, Remembrance Day and Veterans Day - what's the difference?". The Independent. Archived from the original on 18 November 2018. Retrieved 20 November 2018. ^ Street, Peter (7 November 2014). "The great silence begins". Archived from the original on 17 November 2018. Retrieved 20 November 2018. ^ "Reveille Shellhole". p. 1-4. Archived from the original on 20 November 2018. Retrieved 20 November 2018. ^ "ANZAC Day history". Retrieved 20 November 2018. ^ Cecil, Hugh (1998). At the Eleventh Hour. Pen & Sword Books Ltd. p. 357-358. ISBN 978-0850526448. ^ "History of Veterans Day". United States Department of Veterans Affairs. 2007-11-26. Retrieved 2008-11-06. ^ Fanning, Rory (11 November 2014). "Why doesn't the US observe Armistice Day? We're more comfortable with war than peace". The Guardian. Retrieved 18 November 2018. ^ "Armistice de 1918". Retrieved 18 November 2018. ^ "Public holidays global: Armistice Day". Retrieved 18 November 2018. ^ "Serbia to mark Armistice Day as state holiday". 9 November 2012. Retrieved 18 November 2018. Dalisson, Rémi: Remembrance day: 11 November 1922-Today (France) in: 1914-1918-online. International Encyclopedia of the First World War. This page is based on the Wikipedia article Armistice Day; it is used under the Creative Commons Attribution-ShareAlike 3.0 Unported License (CC-BY-SA). You may redistribute it, verbatim or modified, providing that you comply with the terms of the CC-BY-SA.